Home » Lilyana Amezcua, M.D. 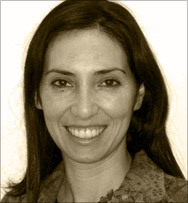 Dr. Amezcua is a board certified neurologist and multiple sclerosis specialist. She joined the USC Department of Neurology as a resident physician in 2003, after having completed her medical degree at Jefferson Medical College and an internal medicine internship at Hahnemann Hospital of Drexel University. She completed a residency in Neurology at USC and served as Chief Resident. In 2006, she received support from the National Multiple Sclerosis Society (NMSS) as a Clinical MS Fellow to develop her expertise in the study and treatment of MS. She was appointed as Assistant Professor of Clinical Neurology in 2008 and Medical Director of the MS Comprehensive Care Center in 2011. The primary focus of Dr. Amezcua’s research involves defining genetic and ethnic contributions in MS, with an emphasis on defining differences in disease expression and progression in individuals of Hispanic descent. Her studies are designed to identify high-risk subgroups of patients who may be at risk for disease progression and could benefit from earlier, aggressive treatments, such as those with opticospinal forms of MS that are more commonly observed in individuals of Asian ancestry. In addition, she plans to address the influence of migration, environmental factors, such as Vitamin D, and genetic factors on responses to treatment MS in this population. Recently, Dr. Amezcua has expanded her studies to include genome-wide association studies (GWAS) to identify the association of ancestral genes that are differently distributed in human populations with clinical and radiological manifestations of MS and response to treatment. Dr. Amezcua is a recipient of the Nancy Davis Junior Investigator Award, and was recently awarded an NIH KL2 award through the USC Clinical and Translational Sciences Institute (CTSI). She serves on the Clinical Advisory Committee for the California and Nevada Chapter of the NMSS and is a council member of the NMSS Hispanic MS Advisory Board. She is also collaborating with the NMSS and Los Angeles County officials to develop a Wellness Center for MS at the historic Los Angeles County Hospital.